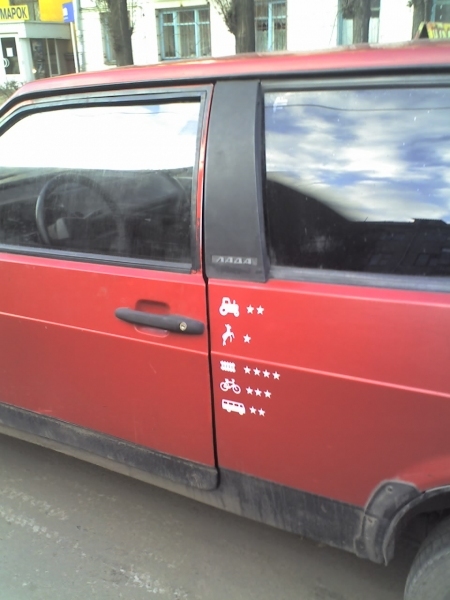 Some Russian drivers now mark their driving skills. Such tradition came to us from the age of World War II when pilots painted a star on their aircrafts for every successful enemy turned down by them. So Russian drivers think they also are some kind of military pilots and all the other participants of traffic are their direct enemies, so the collision with everyone is something like a little victory. The railway mark probably means how much he passed on the red light through the railroad crossing. This pilot has no pedestrian marks, he is probably some sort of human loving specie. So where is the pictures? I can’t see anything. This picture looks photoshoped, espically the first one. They copied it from an insurance ad. 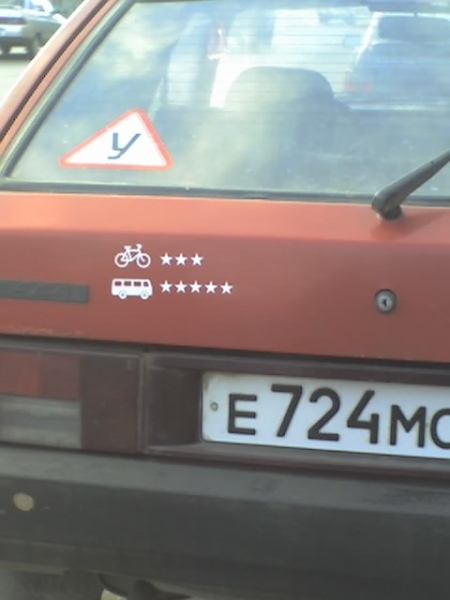 The guy’s Lada had Mercedes logos lined up down the door, and he had a wicked smirk. Even if these stickers on cars are real, it is a joke. The Red Baron shot down many allied aircraft. The plane was shot down with a missile. It’s a tradition of EnglishRussia to pretend not to speak English. It’s really amusing. Have you ever noticed that at the bottom of the page it says “Comments are allowed only in English language” but the creator of this site does not know proper English to begin with? Why you don’t express sympathy for ours guys diying in Chechnya for highly noble causes. This is really bad stuff. Why nobody mentions the real prikol of photos is sign for Chainik in window. It is car for driving school! I thought this was funny! I once had a girl friend that racked up a record like this. She got too expensive to insure, so I dumped her for another. This is not a joke. The pictures are true. In Bulgariq is the same. We live out the Operation “Merciful Angel”! It’s not a railroad sign, it’s a fence! And you can tell me more? thanks in advance.